Christina Stelzer, Diplom Psychologist, studied T’ai Chi with Gia-fu Feng (Colorado) and dance therapy with Anna Halprin (California) and was part of the pioneer period 1982-1988 when a small group of people from the West together with Suprapto Suryodarmo in Java, created the ground from which Amerta Movement rose. Since then she has continued to develop this movement approach within her work, calling it ‘GangArt’ (meaning the specific style and attitude of one’s walk/approach to life). 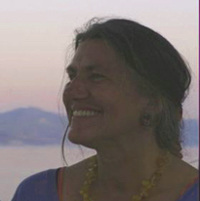 She teaches in Germany and Austria and takes students regularly for retreats to the Greek island of Paros.